Riviera Nayarit Mexico Blog: Try Your Hand At Archery In The Riviera Nayarit! Try Your Hand At Archery In The Riviera Nayarit! This new attraction can be enjoyed two ways: Archery Tag®, in the purest “gotcha” style or Traditional, meaning it can be just for fun or as preparation for serious training. There’s a new attraction for locals and visitors in Higuera Blanca, Riviera Nayarit: it’s a new archery range called Archery Experience Mexico. The open-air range is located on a mountaintop and is ideal for those who have already practiced archery or are looking to try something new. This sport is a new addition to the wide range of options already available in the Riviera Nayarit and can be practiced solo, with family, a partner or with friends. Archery requires no previous knowledge of the sport. The Archery Experience Mexico offers two ways to enjoy it: Archery Tag®, “gotcha” style, or Traditional Style, meaning it can be just for fun or as preparation for serious training. The Riviera Nayarit is one of the few places where Archery Tag® is practiced. This is done with sponge-tipped arrows so there’s no pain and no bruising—just plain fun! They will be offering a Summer Camp for children ages 8-14 during the month of July, running from 9 a.m. to 11 p.m. from Monday through Friday. 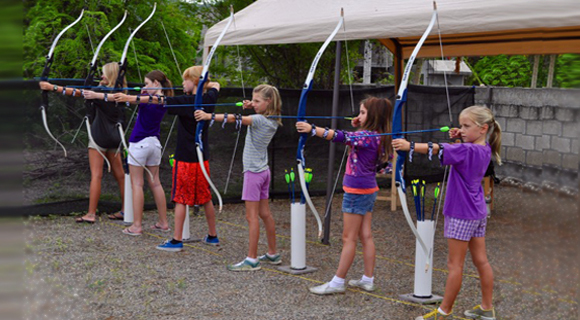 The Archery Range is also available for events such as birthday parties as a fun alternative space.